What is The African Network – TAN? How does TAN intend to achieve its goals? Do I need to be African or of African descent to join TAN? Does TAN have any political or religious objectives? Is TAN a venture capital/investment organization? How did TAN come about? The African Network – TAN is a global, not-for-profit network and support structure of professionals and entrepreneurs with the sole aim of fostering the growth of entrepreneurship and technology in Africa and amongst all people of African descent (African-Americans, Afro-Caribbean etc) worldwide in the Diaspora. TAN was created to address two critical issues afflicting Africa and her children worldwide; Poverty and the lack of technological development on the continent. Fostering entrepreneurship and unprecedented cooperation amongst its members through networking, education and mentoring to create value for all. We strongly believe that the only way to rid a nation or people of poverty is to foster entrepreneurship. America was built by entrepreneurs. Presenting Africa and its potential to the rest of the developed world as the next logical economic center beyond China and India through conferences, seminars, workshops, visits and trade shows and thus attract investments in science & technology. 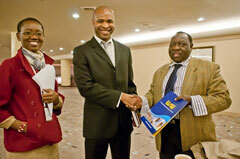 Engaging African leaders to create conducive atmosphere and infrastructure for the growth of free enterprise. Helping business and government leaders in the developed world to better understand the vast potential of Africa and thus facilitate direct investments on the continent. Empowering the young through education and showcase positive role-models and mentors for them. No, TAN membership is open to all, irrespective of color, race or ethnicity – as long as you share our common goals. No, TAN does not have any political or religious objectives whatsoever. No racial, tribal, ethnic, sexual or religious bias. No, TAN is not a venture capital/investment organization. However, TAN members through their various networks of relationships have access to useful resources. TAN also strives to create forums that bring entrepreneurs and potential investors together. TAN was formed by a group of driven professionals and entrepreneurs based in Silicon Valley to address the glaring needs highlighted above. TAN is a global organization open to all worldwide. However, there are currently two chapters at this time – Silicon Valley and Washington DC.